I seldom have three square meals but today I had about four or five meals including the copious amounts of Ngaku we packed courtesy of Ah Yoke Cher. She was a whiz slicing Ngaku (Arrowhead) into the hot frying pan while Seok Hean and I dried it off its oil piece by piece and popped as many into our mouths. So by the time dinner came we were quite full. So we all jumped into the car and as usual Eddie was instructed to turn left and right and somehow amidst all this he missed a turn and so we had a rather scenic (we even had a Thaipusam procession) route to Jalan Datoh and low and behold it was Oversea Restaurant. Now I have three Oversea Restaurants around where I live and each are about two to three kilometers from where I live. I have often been there for weddings, so I kind of knew about the food and the restaurant. 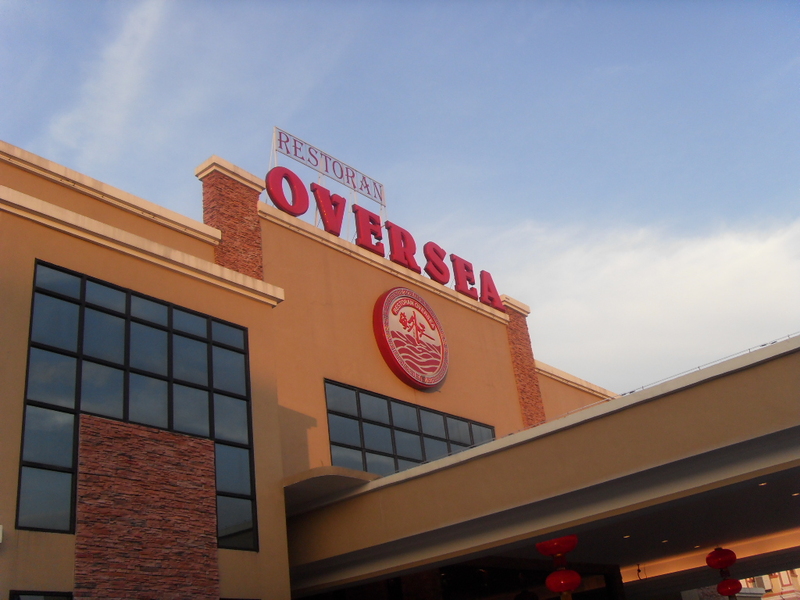 I did not know that Oversea Restaurant originated from Ipoh and where we were was the newest addition. It was a big place and a bit out of place for a restaurant I thought. It was probably a factory building of sorts but I guess it was location location location after all. Still the building looked massive and far bigger then the ones near my house. We entered and it was like a giant school hall. It could probably seat about 800 to 1000 people once the doors and all were opened. It was a bit cold to be sitting in such a big place with only one other table taken. While there was so many staff and so little customers I did think service was not so good. After all Seok Hean had already picked the menu, so they could have been a little cordial. The non complimentary peanuts were served. Emm Looi brought her own tea. Now I have never been to a restaurant with anyone who brought their own tea and I think it is a quaint idea. I think I should try it here and watch their faces getting confused. frightened a young child into not having fish for life. The fish looked mean and wild, and it looked like it would leap off its dish and bite you. Just look at the photo. Flavor wise it was nice and fresh and the sweetness of the fish was brought out with the superior soy sauce gravy. I would have preferred it if there was a tiny bit of ginger. I am a ginger person so I guess it is just me. This is when I wish my friend Angela from Fiji was around because the first thing she would have taken was the head and thus make the fish look a little more friendly. enoki mushrooms, tofu, fu chook, and a vegetable that I cannot remember. I did enjoy it so much that I forgot to take a photo of it. So this was obviously good. The flavors of all the ingredients complemented each other very well. And the tiny bits of kei chee handed a nice sweet bit to the soup. Kei Chee tends to do that to a lot of foods and soups. I’ve even thrown some into fried noodles, the thick soupy kind, absolutely fabulous. The pork belly and salted fish was next. Now I must say this dish was a downer. First presentation wise, it was a big zero. Nothing made it stand out. Flavor wise, all the ingredients overpowered each other that you did not taste the meat properly nor did you taste the salted fish. I think they could have done better with this dish that most people always go for. Maybe it is Oversea Restaurants way of doing things but I must say, presentation on the whole for the first three dishes was rather mundane. This is a favorite of many even Westerners tend to like this dish because of the different flavors and the salted fish that gives it that punch. Sadly for some reason, it looked like the meat and salted fish was ‘stewed’ a trifle bit too long. The Combi Platter was next, now you cannot go wrong with the combi platter and Oversea did a wonderful job. 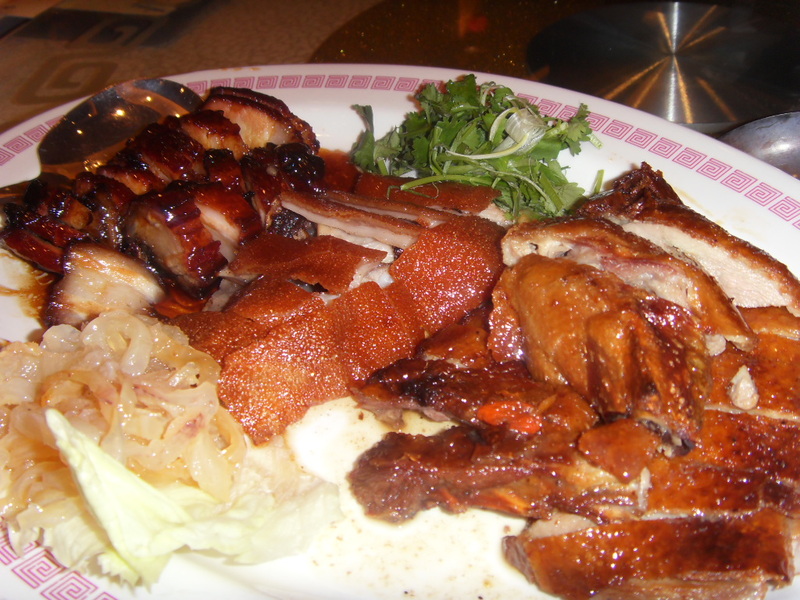 The Combi Platter comprised, juicy pieces of char siew, duck, piglet and a lump of jellyfish. The Char Siew was roasted to perfection, the Piglet, now I am seldom keen on piglet because of the piggy taste, but this one was really nicely done. Perfectly roasted, the piglet was the perfect age, and I always think if they are going to roast young piglets now where are the big ones going to come from in the near future. 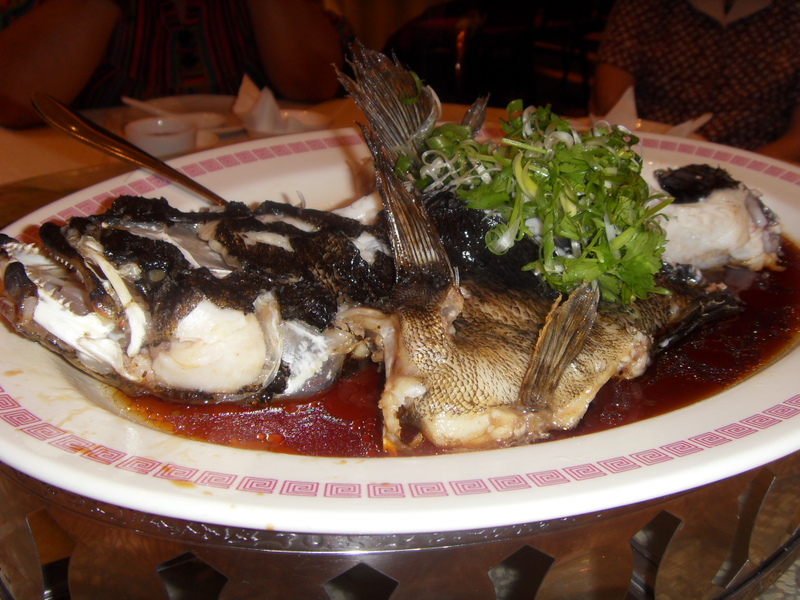 I am sure Oversea Restaurant is guilty of this because they prepare it well and I am sure it is one of the main dishes during banquets. The duck was also perfect, no ducky taste and succulent as well. I always eat duck and I found this duck was rather finely prepared. The Snake Gourd and Tofu was next. 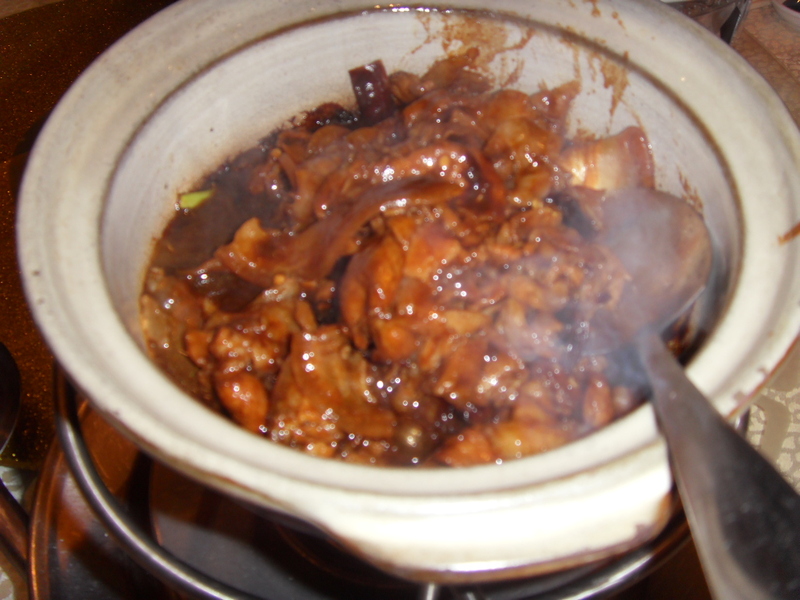 Now while Snake Gourd was once used a lot in Indian food, somehow in KL and PJ we used it for yong tau foo. I am not keen on it for some reason and I was not too keen to eat it as well. The tofu was wonderful though. 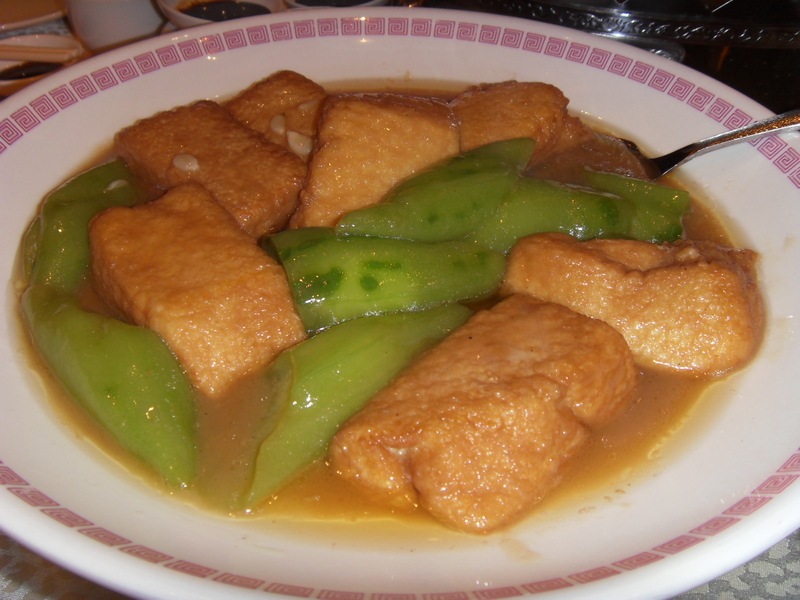 Home made tofu, it almost tasted like meat. A very silky kind of meat. The gravy it was made it was also rich and yet not heavy. 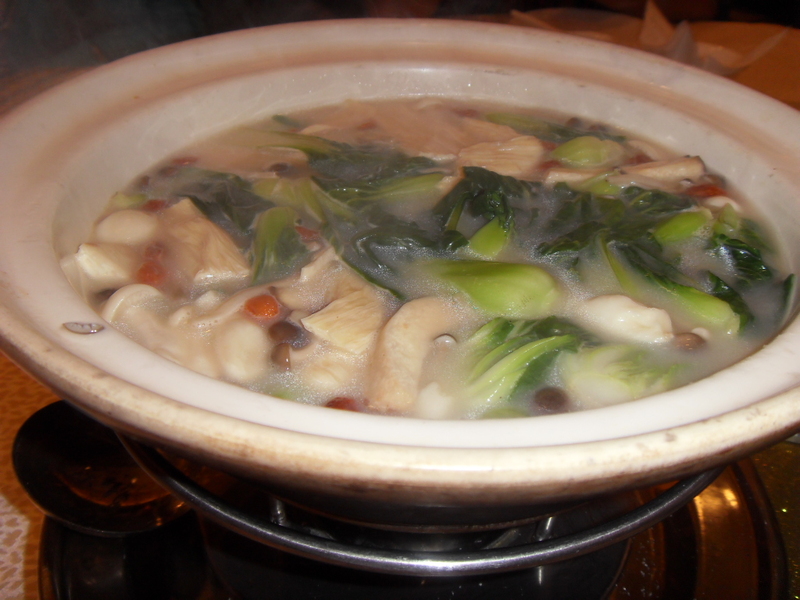 Good stock was used to prepare this dish. I think everyone enjoyed this dish very much. 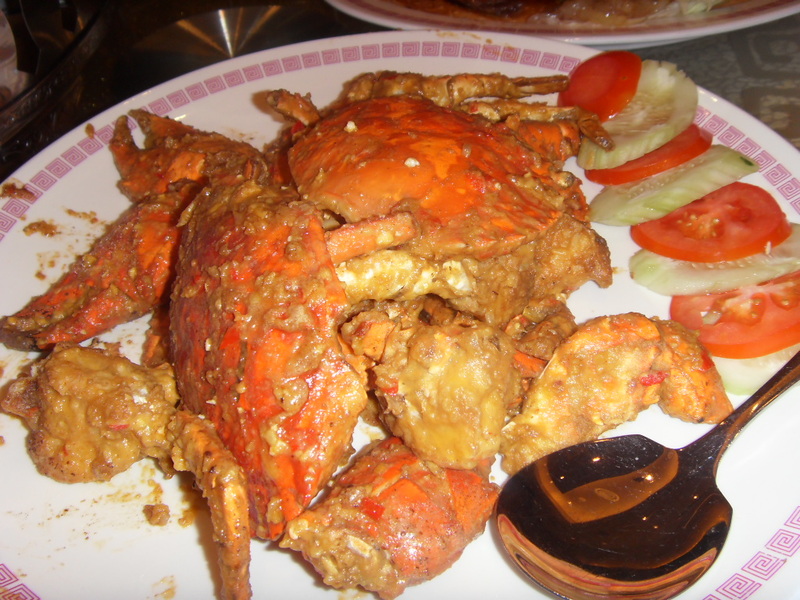 The last dish was the Salted Egg Coated Crab. I have always liked this dish simply because of the salted egg yolk that coats the shell of the crab. It lends a flavor that is never found anywhere. We were all quite full at this stage but we all had a taste. I am not a crab person because I hate having to get my fingers messed up. I only eat crabs when I have someone to take them apart for me. This boy in distress used to work with the chicks many years ago….. alas charms can only last for so long! The crab was obviously alive when it was cut up so the flavor and texture was perfect. For dessert we had the usual fried pancake with lin young filling. Nothing special here. I did find the skin a tad bit too thick. Did not take photos once again, I wonder why? All in all it was an enjoyable dinner with friends. The ambiance was a bit cold due to the size of the place, and the kids at the next table were kind of rowdy running in and out of the toilet. Other then that, it was a wonderful night.